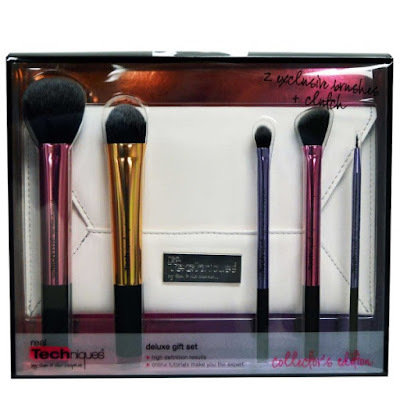 Health and Beauty Girl : Limited Edition Real Techniques Makeup Brushes by Samantha Chapman Deluxe 5 Brushes + Clutch! Limited Edition Real Techniques Makeup Brushes by Samantha Chapman Deluxe 5 Brushes + Clutch! I wanted to share this fabulous deal with my beauty loving readers while it's still on sale and available! If you like makeup and makeup tools like I do you probably won't want to pass up this LE (limited edition) 5 piece makeup brush set by Real Techniques with a clutch! The retail price is $30. It's on sale for $18.99 USD but you can get it for $13.99 with a 5% off coupon! On check out just enter coupon code AGU725 for 5% off. Or you can just click on this link to activate it. This is an amazing deal for this set and I'm not sure how long it will be at this price for. Since it's Limited Edition, once it's gone it's gone! This full face set and a sleek clutch will glam up your makeup routine. Transform your look with this collector's edition deluxe gift set. Reveal Your Inner Expert with High-Tech Brushes + Online Tutorials. Exclusive Glam-To-Go-Clutch: Stores brushes for touching up your look on-the-go. Me too! Thanks for coming by! I love that brush too! I'm pretty certain that shipping to Australia is the same as to Canada which is $4 by post or right now it's free if you spend over $40. That's why I shop there for so many things, their international shipping is so cheap! If shipping is only $4 to Australaia this sounds like a great deal for us Aussies! It is! iHerb has really cheap international shipping. it's the same cost to me in Canada. Not sure how they do it! RT is expensive here in Canada too. I don't know how iHerb keeps prices and shipping so low! This is a super deal! I should add to my brush collection but need to sort through and see what I'm in need of. Thanks for sharing! Fabulous - thanks for sharing!! I love RT too. Great quality for the price, especially when you buy a set.